Irish Prime Minister (Taoiseach) Leo Varadkar has said that Brexit will define the UK for the next generation. Mr Varadkar added that "it doesn't have to define" the Republic of Ireland. The taoiseach told delegates at the Fine Gael conference in Wexford that "we live in extraordinary times". "The last two and a half years, the last two and half months, even the last two and a half days have seen many twists and turns in the Brexit saga," he said. 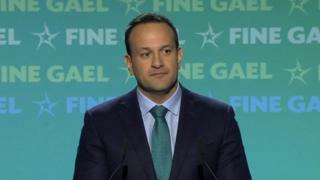 Earlier on Saturday, the taoiseach said there were "rough and preliminary" plans in place to avoid a hard border on the island of Ireland if there was a no deal Brexit. On Friday, Mr Varadkar said Brexit could be delayed for another year if British MPs decide they want the government to radically change its policy. Just weeks ahead local and European elections Mr Varadkar used his speech to criticise opposition parties. He said Fianna Fáil was "a party of no ideas, no policies, no alternatives". Mr Varadkar added the party stands by the Good Friday Agreement and that the party supports an "ever closer co-operation" between north and south and east and west. He reiterated plans for a referendum in the autumn to extend voting rights in Republic of Ireland presidential elections to "all Irish citizens no matter where they live". "I know that there are mixed feelings about it and it's a referendum that won't be easily won. But I am sure it's the right thing to do. "There's no such thing as a second class Irish citizen. I believe an Irish citizen in Belfast, or Sydney or Chicago is every bit as Irish as one in Wexford or Dublin or Galway," he said.